This article is one of a series of articles discussing why Grid 3 software is ideal for quadriplegic assistive technology. Communications devices for quadriplegics need to have custom options, as no two disabilities are alike. Today we will discuss accessible tools and apps, input methods and computer control. 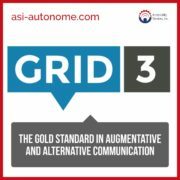 Grid 3 software and the versatility of the autonoME’s speech generation device (SGD) and environmental control unit (ECU) features is what makes it the preferred SGD / ECU in hospital and residential settings.